Random Thoughts on a Friday | Nicole, Deipnosophist. You can make fun of the shoes on my dog, but all this walking without shoes made her filthy. So it was bathtime for Sunny. Look at that poor drowned rat!! 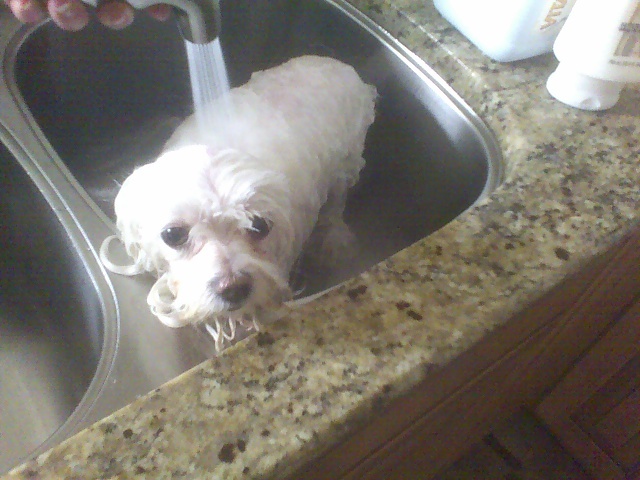 Bathing her reminds me of one of the many reasons I like small dogs: I can bathe her in the kitchen sink. She’s always been very easy to bathe, but now that she’s older, she fusses when I touch her joints, worried about pain. I have to reassure her and be very gentle. I drove to my sister’s house for the day. It was “No Refusal Friday” on a local radio station, and they played Patience, from the beginning note to the end, uninterrupted by annoying DJs. It was beautiful. I whistled and sang the entire thing. What a throwback to being a teenager. My brother and I would be in the Pumpkin with the custom speakers cranked and the Warp Drive enacted, he strumming his air guitar and both of us belting the lyrics and concocting lip-syncing scenarios for the high school talent show. Were we on our way home from school, using the super-secret right lane and blasting past everyone to the stop sign? Were we on the way home from church after going to Sap’s and buying a make-your-own dozen, wolfing down all 12 before even finishing the two-mile drive home? Those simple moments were the best. The windows were down, the car was worth a couple hundred bucks, and the $20 allowance made me feel rich. At those times, I was truly in the moment. Nothing mattered except the next lyric and it felt like total freedom. As I heard the song today, I remembered those fantastic times. I sat in my sister’s driveway until the song was finished. Ah, memories. Lastly, is my blog becoming more and more blathery? I think that being home so much has made my posts a little banal. I don’t care. On most days, the internet is my connection to the outside world. But honestly, it doesn’t seem like I’m adding anything of value. I read other people’s blogs, and at least they’re funny or original! It just reminds me that I’m unique. Just like everyone else. OK, not lastly. 🙂 So, why do people blog? I know many people who do; I read even more. Why do we fling so much personal information out into the public eye? I would say that it’s an extrovert-style thing to do, but I know many introverts who blog. A quick scan of Google revealed this article and other interesting opinions on why we do it. But more interesting than the articles was, ironically, a blogger’s blog linking to five other blog posts about blogging. I guess I blog because I like to write and it’s an interactive way to stretch my literary legs. I write recipes and movie reviews and hope someone somewhere finds them useful. I like the idea that I can Google for an idea and connect with a random blogger and feel a sense of global community. Isn’t that unique? I like “blathery” blogs, especially for people I know. It’s one way to stay in touch at times that are convenient for everyone, and for introverts, we don’t even have to use the phone! I like blogging since it’s a sort of journal for me; I can go back and see what I was doing or thinking, and I can be held accountable for goals I announce (note that I don’t announce many!). I like that my family can keep up with what I’m doing, I like that I can get on a soapbox now and then, and I like sharing pictures from things I see or do. I worry that my blog is also too banal, but I’m a bit afraid to really get into political/ethical/moral/etc discussions because I don’t want to alienate folks (I guess that reflects real life). That car ruled. I used to take it ramping, and bottomed out the suspension multiple times (OUCH). I drove the crap out of it, delivering pizzas too. There was no better value.